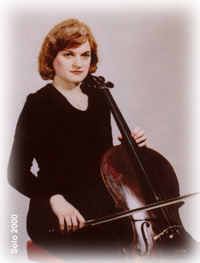 The music ensemble "COLLAGE" was founded in September 1996 by five students of the accredited Lysenko Academy of Music (Lviv,Ukraine). 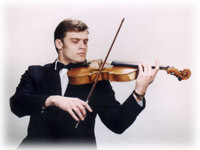 By the summer of 1997, the ensemble had won critical acclaim at the International Youth Festival (joint event with the Wagner Festival) in Bayreuth, Germany. "Collage" has matured into a virtuoso class ensemble on performance tours throughout Europe and North America. Group leader, Halyna Zhuk (violincello) and Sophia Soloviy (soprano) are prizewinners of international competitions for solo performances. 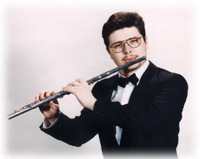 Flutist Serhiy Lutsenko plays a unique instrument with a finger-breaking old (pre-Boehm) method, a style mastered by only a few musicians today. The repertoire is a "collage" (hence the ensemble name) of diverse compositions numbering more than 60 pieces of various styles and genres, ranging from well-known classics to a number of beautiful selections of Ukrainian music. The program demonstrates the high standards of the group�s musical training and the versatility of these young musicians. Favorite Ukrainian composers include M.Lysenko, a contemporary of R.Schumann, who introduced the era of romanticism in Ukrainian music. 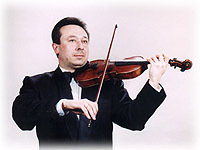 S.Ludkevych composed mainly choir music around the beginning of the 20th century. V.Barvinskiy, Ukrainian composer and patriot, was exiled to Siberia during the Stalin-period repressions in the Soviet Union. His "Lord�s Prayer" reflects the deep spiritualism of the Ukrainian people. The ensemble's second album, "Collage 2000," incorporates music of different styles and areas. The selections range from a sonata composed by Giovanni Legrenzi (15th century) to a light-hearted version of "Ouverture Collage," which was written for the ensemble by the young composer Oleh Zhuk. The instrumentals of J.Strauss, K.Saint-Saens, A.Petrov, and Scott Joplin's Ragtime promise an exciting musical kaleidoscope. The selections of Ukrainian music on this CD include: an aria from the D.Bortnianskyi (1725-1825) opera "Alkid"; a Ukrainian folksong, "Von Dorf zu Dorf" (Vid sela do sela/From village to village), edited by Yuriy Meitus; the song "Schlaf Jesus, schlaf" (Spy Isuse, spy/Sleep Jesus, sleep) composed by Iosyp Kystakevych, edited by Serhiy Hurin. Soprano Sofia Soloviy sings in Ukrainian, Italian, German and Polish. Copyright © BRAMA, Inc.; all rights reserved.